Web browsers are becoming more and more powerful, and new APIs like the Web Audio API and Audio Data API are making the web an ever more interesting and dynamic place. Orman Clark has designed a pretty slick compact music player interface in PSD some time ago. 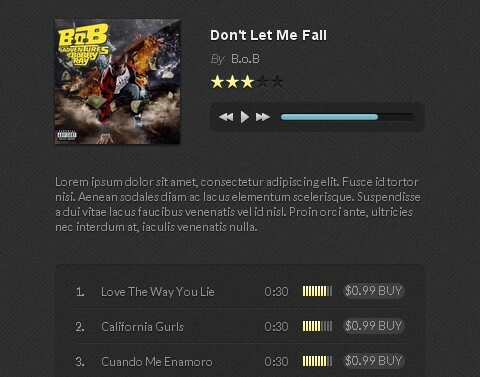 Now, someone has coded the design into an awesome HTML5 Music Player in jQuery for us. The user interface is very clean and easy to use. 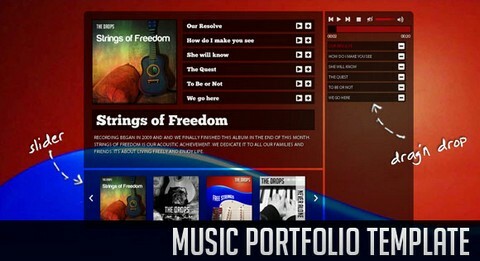 You can also check out other HTML5 Music and Audio Solutions for jQuery we have mentioned before. 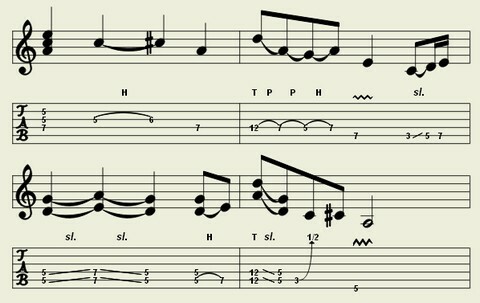 Would you like to create music on the web? Whether you are an amateur or a pro you will be able to satisfy all your needs with Soundation Studio — a powerful online sequencer with 11 real time effects, 3 synthesizers, a drum machine and a fully integrated Sound Shop. Soundation Studio offer you an introductory library of over 400 loops, the possibility to buy more sounds and in short, a place where you can store all your sounds as well as your own productions. Anything you create in Soundation is your production, the only exception is you cannot transfer, upload, share, give or sell any of the isolated or individual sound files. They are licensed to you to use in your productions but not to give away, upload or sell as individual loops or samples. Yahoo! 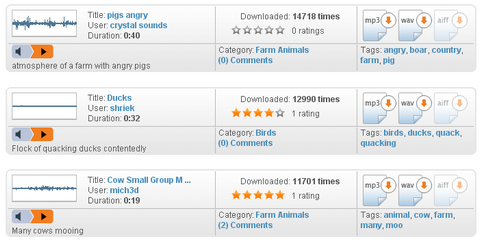 Media Player enhances your web site or blog by creating an embedded player for each audio link. All the links can be played with one click, and it automatically finds all audio links on your page, turning your page into a playlist. Magical floating design never gets lost, is available when you need it, gets out of your way when you don’t need it. So that it keeps the user in the page rather than sending them away to a media player. This is done by adding one line of HTML to your page. 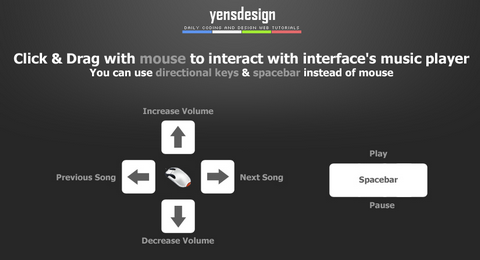 YensDesign has created an amazing music player coded in xHTML and jQuery that made use of mouse gestures and hotkeys. You can Click & Drag with mouse to interact with interface’s music player or use directional keys & spacebar instead of mouse. Using the Ribbit Voice Platform, voice is now a programmable feature that is free from the traditional device. Going way beyond the call, Ribbit is an open platform for multi-protocol communication, empowering a new market of voiceware applications and services. It can go anywhere… on a phone, on a webpage, inside email, and in an existing app. Voice can now live inside any environment including online communities or stores, CRM systems, call center applications, media properties – you name it. It can be captured, stored and sent in traditional and non-traditional ways…it is totally free for your innovation across any industry. Coding voice as a feature is easy. Build your rich voice applications in either Flex or Flash. Their voice components are available in both flavors. Now you can easily add the ability to make and receive calls, record, send and receive voice messages, as well as add and organize contacts to your applications with the Ribbit API. Leverage the Ribbit Voice Platform to enrich your applications with voice, others have. 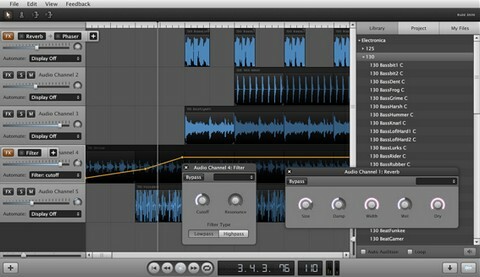 Soundsnap is a nice platform to find and share free sound effects and loops- legally. It is a collection of original sounds made or recorded by its users, and not songs or sound FX found on commercial libraries or sample CD’s. It was originally started by a small group of sound people from all over the world. Their common belief is that sounds and samples should be free for everyone to use in their projects, commercial or not. Their users are a diverse mix of sound designers, sound artists, web game developers, filmmakers and music producers. Hobbyists and home video makers are welcome too. They encourage everyone to upload high quality sound FX and samples, helping them make every kind of sound available on Soundsnap.